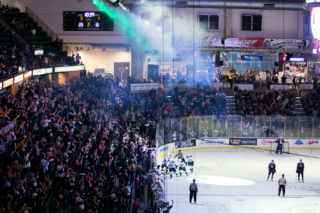 KENT, Wash. – Ethan Bear delivered a late third period power play goal to snap a tie and help the Seattle Thunderbirds sneak by the Everett Silvertips, 3-2 before an announced crowd of 5,075 fans at ShoWare Center in WHL action on Saturday. 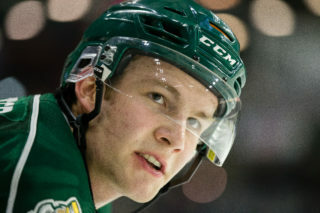 The Silvertips, who went 46 straight games before taking back to back losses in regulation, had Patrick Bajkov earn a muti point game while Dominic Zwerger chipped in with a first period goal. 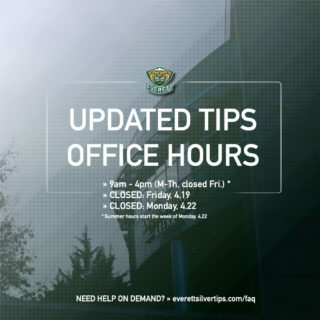 The Silvertips fell to 3-2-1-1 in the head to head series – three more games remain and the teams will wait until late February to renew the series. 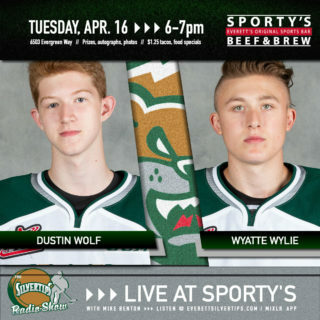 Carter Hart set the tone with a highlight reel glove saves in the first 10 minutes of play and Zwerger lifted the Tips to a 1-0 lead, waiting out goaltender Matt Berlin at the left post with poise with 4 minutes left in the opening period. Keegan Kolesar, off a feed from Mathew Barzal, converted on the Tips defensive zone turnover for a 1-1 tie at 3:56 of the second period but Patrick Bajkov stormed back on his snapper from the left circle at 15:20 for a 2-1 lead, converting Connor Dewar’s cross-ice feed. The Silvertips who went 12 straight games without allowing a power play goal, then saw the game slip away with consecutive Thunderbird power play strikes. Ethan Bear’s center point shot got enough of a Kolesar screen at 12:54 for a 2-2 game, and Bear converted a center point strike with 1:09 to go in regulation for a 3-2 lead. Hart, who stopped 10 shots in the first 10 minutes of play, made 27 saves. 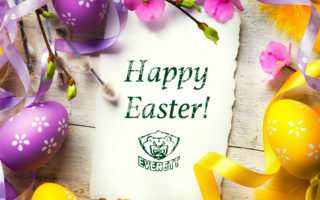 NOTES: Silvertips scratches included Noah Juulsen, Lucas Skrumeda, Brian King, and Riley Sutter … Bajkov has 14 points in the last 13 games … the Tips lead at the end of the night was six points head of Tri-City for first place in the U.S. Division, with five games in hand.